My career as an educator started many years ago in a toddler classroom. I had yet to get my Montessori training, but I was doing my best to understand what I was to do and why the children were doing what they were doing. I remember the lead teacher explaining to me that I was to get each child to sit down by themselves and work with one activity at a time. In a class where the children just seemed to run and jump around, I could not fathom, how this was possible. When I think back to that image, I still get overwhelmed with the energy the had, so much energy and not sure how to direct it. That is the key, what I learned after two Montessori trainings, three children of my own, and a number of years in the classroom…they need a purposeful place to direct their energy. I can clearly state that I had no idea back then, and I apologize to those children who wasted their time jumping circles around me. But now, I can see it, creating an inviting space lures them in. Dr. Montessori wrote that we are to “engage the whole personality”. this is done by creating interesting and purposeful opportunity. A parent had her first visit to Studio June this week and as she explained her love for our Studio after just one visit, she said, “every thing is so beautiful, and it gets even more enticing each time I open a box, or look inside a door!” Her child seemed to feel the same way, excited to return the next day and dive right back in. We have discoveries for the children. We allow opportunity to explore and discover. We do not spell out all the details, we rely on the child’s natural attraction to tiny details to grab their attention and pull them deeper into concentration. An environment that upon entering may seem a bit understated, but with the first reach for the shelf offers a world of exploration. Interesting things to discover is not enough, though. They need more! And for most children that means movement. The mind and body must work together in order for a child to gain meaningful knowledge. 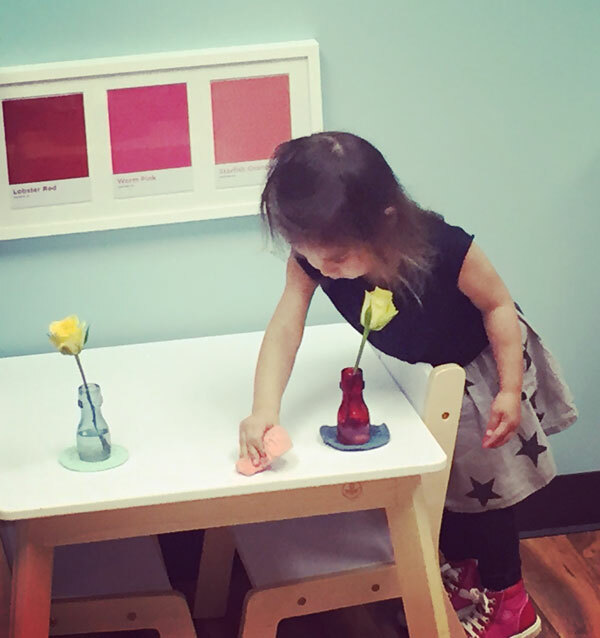 One popular activity at Studio June allows the child to stand and work. Sitting is not always an option for a young child who has just learned to walk, sitting is not usually their preference. So we meet that child where he is. At Studio June we have a magnetic board with beautiful magnets we change out weekly. I like to put a photo copy of the magnets on the board to encourage matching. While standing at the board the child discovers the different magnets, each week a new category (mammals, trucks, farm, fruits, veggies). This can be a language activity where you introduce the names, a matching and visual discrimination activity, or a movement and memory activity. I recently discovered a new set of magnets from Your Food Story. They sell a set of fruits, vegetables, and grains. Each magnet is a photograph of the food. The wood magnets are beautiful and fun! I have teamed up with Your Food Story to offer a giveaway of a full set of their magnets: Fruits, Veggies, and Grains!